They settled on the leveled or terraced areas on the slopes of steep mountains near rivers and streams with free, clear, running water through the Chico, Pasig, Tanduan rivers with wide plateaus and floodplains, as well as, large portions of open grasslands. As a result, principal sources of livelihood among the Kalinga is the payaw (ricefields) and the uma (swidden farm). Aside from food production, cattle are pastured in the fields and poultry raised in the backyard. 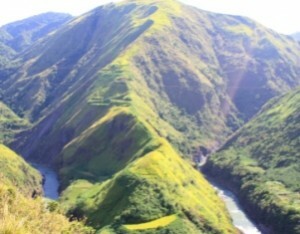 Small fish (ugadiw), shell, and marine life are gathered from rivers. Traditional hunting continued to be practiced and by men only, in the forest using spears, indigenous traps or rifles for wild pigs, deer and wild fowl. Fruit trees, coconut, coffee, and bananas are grown while sugarcane is planted and made into basi (wine). Other economic-driven activities among the Kalinga are cloth and basket weaving, blacksmithing, and pottery; they're renowned for their intricate hand-woven textiles and magnificent, colorful beaded jewelry. Kalinga society may be stratified into lawa or kapus (poor) and the baknang (wealthy). Among the signs of prestige and wealth are possessions of several ricefields, working animals, heirlooms like china plates and jars, agate head/necklaces and brass gongs. Moreover, the identification of the self with the kinship circle could be such that whatever an individual does is the responsibility of the group; likewise, whatever threatens the security of the group must be opposed by the individual. Therefore, many villages or ili, in Kalinga are located in strategic areas where the villagers can be forewarned of intruders, or where the surrounding terrain is rugged and form a natural defense against “tribal wars.” Tribal wars happen when a bodong peace pact (system) was either broken or violated. Essentially, the bodong is the most meritorious and efficient Kalinga institution; it is a peace pact/treaty between two tribes, wherein the Pagta or laws on intertribal relations are established. The bodong also represents the Magna Carta of the Kalinga.